Vic Rogers, former Group and Technical Director of Westland Helicopter, died on January 23, 2015 at the age of 88. Rogers joined Fairey Aviation’s inspection department as a shop boy at the age of 15, becoming a Junior Inspector and then an aeronautical engineering apprentice. In 1946, he was awarded a scholarship to attend the newly formed College of Aeronautics at Cranfield, gaining a Diploma in the College of Aeronautical Engineering (DCAe) with Distinction in Aircraft Design. Returning to Fairey in 1948, Rogers joined the new Helicopter section playing a key role within the Stress Office. He was instrumental in establishing a sound analytical approach to stress and dynamic analysis and other technical challenges within the emerging field of helicopter design with specific responsibility for stress and dynamics development throughout the Fairey Rotodyne program. 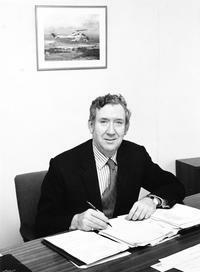 During the 1960s, the British government drove the consolidation of all helicopter activities into Westland Aircraft Ltd.; Rogers thus moved to Westland Helicopters in Yeovil as Deputy Chief Designer in 1963 and was appointed Chief Designer in 1966. Responsible for the initial development and flight program for the Westland Lynx, Rogers was appointed Technical Director in 1972. He joined the Westland board in 1980 and retained responsibility for technical issues until he retired in 1988. Rogers also served on multiple industry boards and committees associated with design and airworthiness standards. Joining the Royal Aeronautical Society in 1944, Rogers was elected a Fellow in 1963, and received the Society’s Silver medal in 1979. Rogers was a member of the Westland team of five (see photo, second from right) that received the Royal Academy of Engineering’s MacRobert Award – “Britain’s most prestigious engineering prize” – in 1975; the award was bestowed for the design and development of the Lynx helicopter rigid rotor and conformal gear transmission. Rogers was elected a Fellow of the Royal Academy of Engineering (FREng) in 1979, a distinction of which he was particularly proud. He was recognized as a Commander of the Most Excellent Order of the British Empire (CBE – the third rank in the British chivalry system) by the Queen in 1986. Rogers was uncompromising in his attitude towards airworthiness and design integrity. He and his team were responsible for establishing a 63 fundamental understanding of the dynamics behavior and stressing analysis methodologies required for safe rotorcraft design, a fitting legacy to the industry.